“We called for these demonstrations so the political leadership realizes that the youth is in dire need of freedom,” student spokesman Karim Farahat said in a statement issued by the Brotherhood. In Cairo, some 2,000 students, mostly Muslim Brothers, staged protests inside Al-Azhar university. Three were arrested, police said. Another 1,200 protested at Ain Shams University in the capital. Some 1,500 protesters held a rally at Cairo University, lining up in rows outside the university gates in front of a line of riot police. “Stand up, Egyptians, we want nothing but freedom,” some signs read. “You, our rulers, what will you tell God of the 70,000 uncharged detainees, of hundreds of people being killed under torture in police stations … of the youth lost their ambitions because of unemployment?” demanded a statement signed by the “Islamic trend” and distributed inside Cairo University. 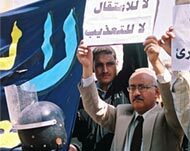 Egyptian security personnel in the southern city of Asyut have detained five people during pro-reform demonstrations. Protesters from the Kifaya (Enough) Movement, which has organised a number of demonstrations in Cairo against Husni Mubarak’s rule, were on Tuesday prevented from holding a rally by riot police. “Two people from the Kifaya group who tried to demonstrate on the streets in central Asyut were detained,” a police official said. Officials also said police detained three protesters when 2000 agitating students at Asyut’s branch of al-Azhar university tried to move their protest outside campus. The protests were confined to university grounds because because Egypt’s state of emergency – in force for the past 24 years – forbids public gatherings of more than five people without government permission. Judges in Egypt are threatening to disrupt supervision of presidential and parliamentary elections later this year if key judicial reforms are not passed beforehand. The threats are part of an unprecedented attempt by some members of the judiciary to push Egypt’s President Hosni Mubarak into conceding greater separation of executive and judicial powers. As many as 1,000 of Egypt’s 12,000 judges should attend a meeting of the Judges’ Club – the professional association – in Alexandria on Friday where a boycott of the elections will be debated. A subsequent meeting would be held in Cairo next month, they said.